These molded and painted images are made of clay mixed with fine sand and wheat straw. They were very popular in the early caves of the Mogao Grottoes and served to set off the free-standing Buddha in the main niche. Adhered to the wall by their flat backs, the figures are in low relief on their front. The molded images include Buddhas, bodhisattvas, celestials, lotus flowers, and so on, all colorful and stunning. This bodhisattva wears a high chignon. He holds a lotus bud in his left hand. His right hand hangs naturally just touching his robe. This bodhisattva, in a red robe, clasps his bent knee in a naturally relaxed pose. The bodhisattva holds a lotus bud in his raised right hand and sits with his legs pendant. He wears a translucent blue robe with his right shoulder bared. 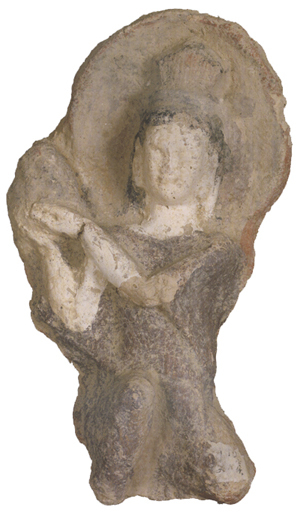 This kneeling bodhisattva is holding a lotus as an offering. The bodhisattva holds a lotus bud in his raised right hand. He is wearing a translucent light blue robe with his right shoulder bared and a matching headdress. 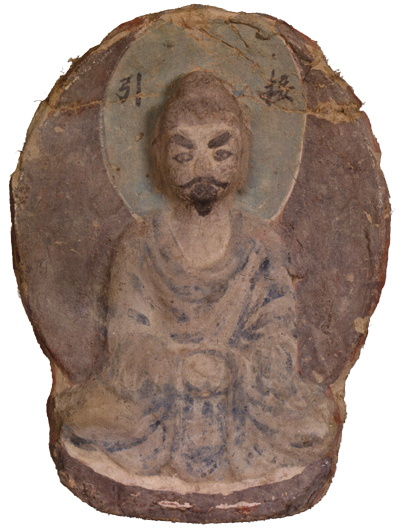 This bodhisattva has an almond-shaped nimbus or halo. He kneels with his hands pressed together, indicating that he is listening respectfully or praying. The neck was damaged and has been restored. 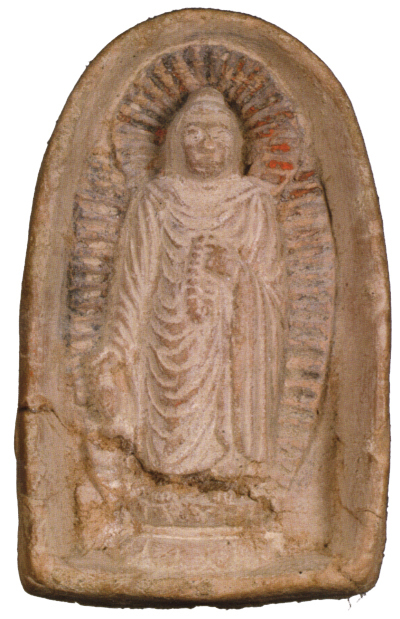 This Buddha has a red oval aureole. He wears a blue kasaya robe, very different from the more common form in burgundy red, and sits in the meditative lotus position. This image was molded in brown clay stucco. The Buddha holds a mala (prayer beads) in his left hand and a vase in his right hand, while standing barefooted on the double-lotus base. The rays of his halo and aureole are depicted by radiating raised lines. The parallel folds of his kasaya robe form a step-like pattern. 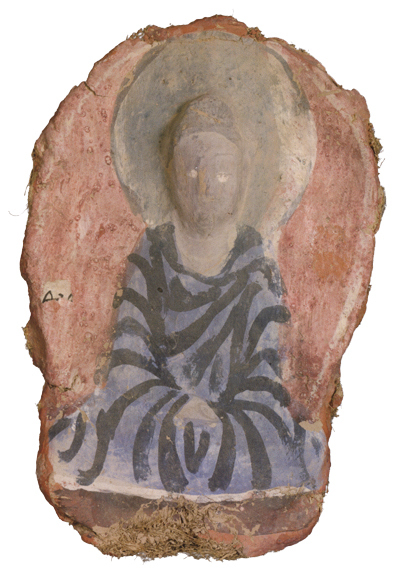 Most of the pigments have fallen off, but some red (halo), blue (aureole), and white (Buddha’s face, robe, and lotus base) are still visible.